Cut off the bottoms of the bok choy to separate the leaves. Separate the leaves. Tear leaves into small pieces. Pour olive oil into the skillet. 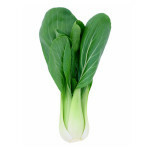 Add the bok choy and sprinkle with salt and pepper. Cook until the leaves turn a bright green color and a little soft. Add the sesame seeds and oil. Enjoy!